On the heels of a reduction in his largest energy holding, Icahn parted ways with most of his stake in Transocean (RIG), the largest decliner of his five oil-related holdings, all of which are down substantially. Icahn sold 16 million shares of the British offshore oil driller Transocean on Friday and Wednesday, reducing his interest in the company from 5.88% to 1.5%, with 5,477,900 shares left over. With an average sell price of $9.59, Icahn realized an approximate 81.2% loss on the holding since he started it in the second quarter 2013 at an average price of $51. "The Reporting Persons believe that Jeremy Thigpen, the Chief Executive Officer of the Issuer, and his management team have done an outstanding job given the challenging environment, and the Reporting Persons continue to have confidence in them going forward" the related securities filing said. "The Reporting Persons reduced their position in the Shares in order to recognize a capital loss for tax planning purposes." Icahn made similar comments about Chesapeake (CHK) when he reduced the position, his third largest in energy, by 51.6% last week, at an approximate loss of 62%. Although Icahn had an agreement with Transocean that his two board representatives would resign if his stake fell below 10,817,716 shares, both parties agreed they would continue to serve even after the sell. Transocean's shares have collapsed 79% over the five years, including a 14% slide year to date. The price has jumped 6.09% on Thursday, the day following Icahn's distancing, as the price of Brent crude rose 55 cents, or 1.13%, to $49.24 a barrel on the Organization of Petroleum Exporting Countries' agreement to cut output. Transocean's revenue fell to $5.74 billion in the trailing-12 months, its lowest since 2006. Its profit was $1.26 billion for the same period, up from $791 million in 2015, as it sold assets and paid down debt. The company also produced free cash flow for the past two years, but it declined to $15 million in the trailing-12 months, compared to in excess of $1 billion in 2015. The oil company trades at a 10-year low P/B ratio of 0.24 and a P/E ratio of 3.12. 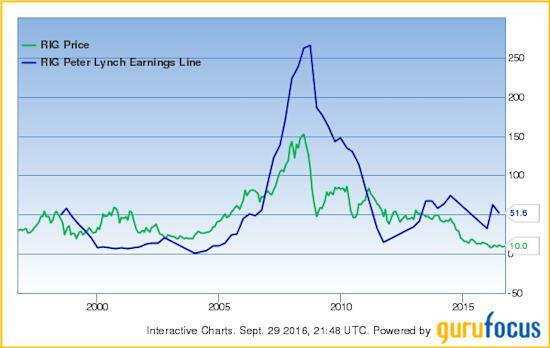 It also trades below its Peter Lynch earnings line, meaning it is undervalued. See Carl Icahn (Trades, Portfolio)'s portfolio here. Start a free 7-day trial of Premium Membership to GuruFocus.